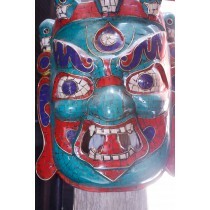 This beautiful wall hanging featuring Ganesh mask is hand-carved by a experienced artist from Lalitpur, Nepal. He is in this filed from generations. Wood is used for creating the mask. It measures 7.5" of width and 14.5" of height. This beautiful wall hanging featuring Bhairav, the fierce manifestation of Shiva. 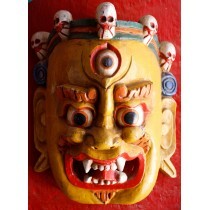 This masks is hand-carved by a master craftsman in Lalitpur, Nepal. He is in this field from generations. Wood has beenused for creating the mask which measures 9.5" of height and 12" of width. 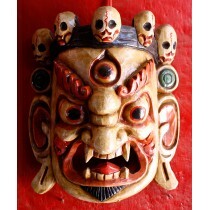 This mask is beautiful decoration to hang on walls in home and offices.